A rock star has admitted burgling a bandmate's home. Pete Doherty, a singer and guitarist with The Libertines, pleaded guilty at Horseferry Road Magistrates court in London to breaking into a flat belonging to his friend and fellow frontman Carl Barat. The list of items taken from Barat's Harley Street flat on 25 July included an antique guitar, laptop, video recorder, CD player, mouth organ and books. Mr Doherty, 24, from Kensington, west London, was granted bail on Monday. His case has been adjourned until 8 September for pre-sentence reports. 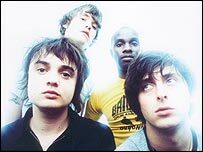 The Libertines are one of the most promising new British rock bands to appear over the last year, with three top 40 singles. Doherty has been absent from the band's line-up in recent months because he was "unwell", and the remaining three members played a UK tour without him. But it is unclear whether Doherty has left the band for good.